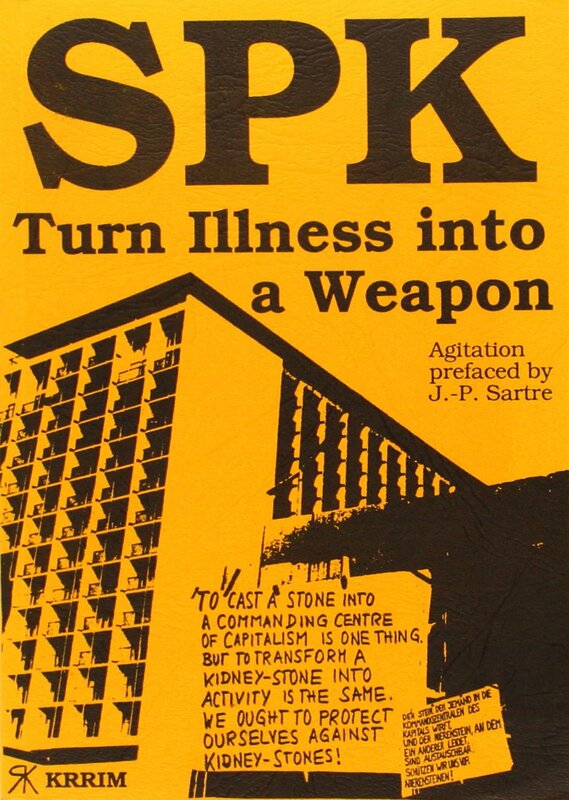 Sozialistisches Patienten Kollektiv, Turn Illness into a Weapon, KRRIM, 2002. During the times more remote there existed astrological maps in which the governors of your brain took names like moon (luna) or cancer, the governors of your muscles Mars and so on. Those oldy names which nevertheless represent still existing pathways and exchange banks for other demons and devils, possessing and obsessing, interested in imperialism, but enemies of every kind of revolution concerning both, namely cosmic and social matters, for sure (kosmisch-soziale Revolution). In future there will exist more and more groups formed by special forces of illness, developing real in-dividuation (MFE). A special force of illness is mania which, if developed collectively, works like a musical species (Musikgattungswesen, nicht harmlos) killing all discipline, by transcendence. The same about a collective which develops its self-chosen addictions (Körpersüchte) exercised body by body, for addiction then is a deadly weapon against drugs, while turning all bodies to a well tempered species (Wärmekörper, wild), thus by immanence. Did you ever divide a melody, a lot of warmth, an illness or some other species? Of course not, for such individualities are either individuals or divisible, thus no individuals. Perhaps Plato and Bergson forgot to mention it in the completeness, now necessary to enable the doing it, and Pluto, grouping the imponderable into weight, the weight into imponderability, therefore now is mad at them and resorting to earthquakes. Make use of your own experiences about illnesses and put fantasy into action. Those things are meant if there is the question about how to be up to date. SPK - TURN ILLNESS INTO A WEAPON is the first glance to a future to be done free of (Endlösungs-) names, governors, health factories and so on. We call it Utopathie.